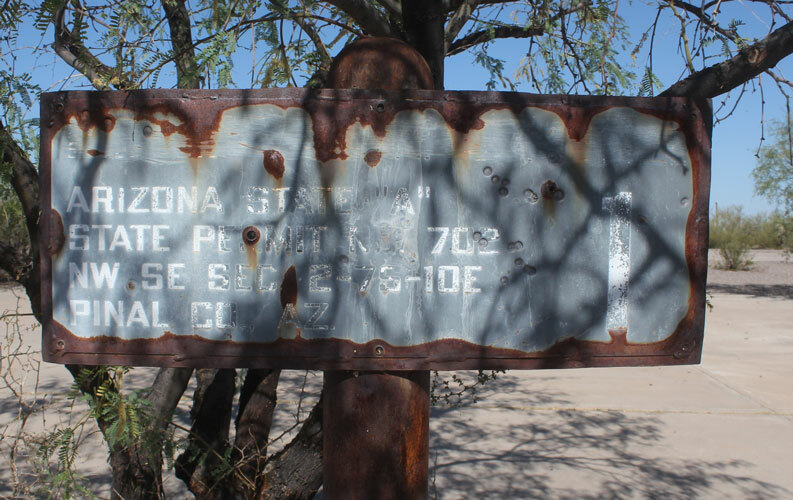 Arizona's Deepest Drilled Well and Other Sites in the Picacho Mountains. The Picacho Mountains are located east of Interstate 10 approximately 50 miles northwest of Tucson. With little development, and many primitive roads, the area is well suited for backcountry exploration. One possible "tour" of the area is shown on the Google Earth Image above. 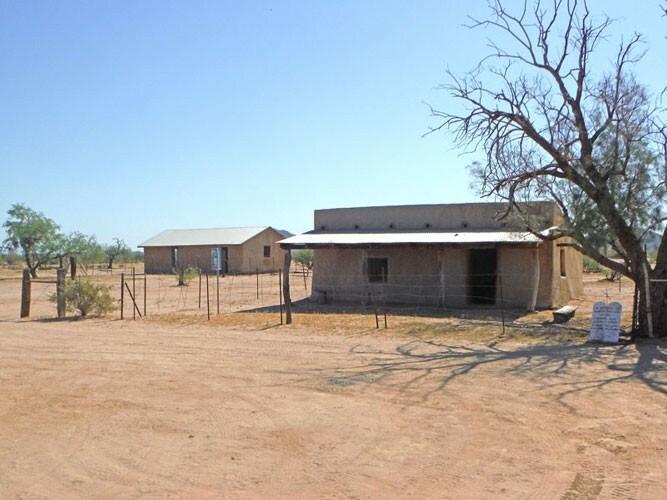 To the northeast of the range, approximately 1 mile south of the intersection of Highway 79 and Deep Well Ranch Road is a dirt road that leads to the site of Arizona's deepest drilled well at: N 32° 50' 27.05" and W 111° 17' 01.42". 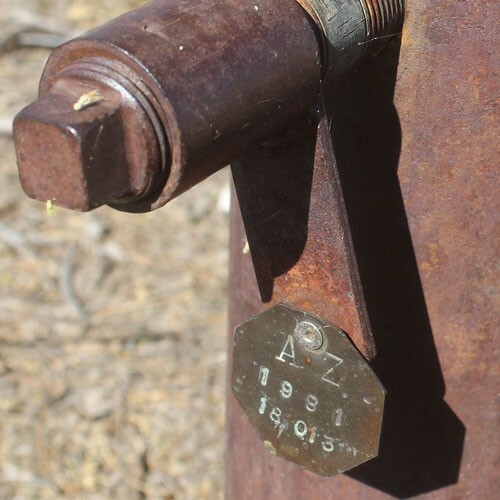 The association of the deep well with the name of Deep Well Ranch Road is purely co-incidental. In 1980, after several years of seismic testing, petroleum geologists associated with the Phillips Petroleum Company were confident that a well drilled at this location would hit oil at a depth of 8,000' to 10,000'. With the approval of a 12 million dollar budget, and a committment to drill to 20,000' if necessary, the drilling project began. This photo is from a March 1980 issue of "Fieldnotes", an Arizona Bureau of Geology publication. 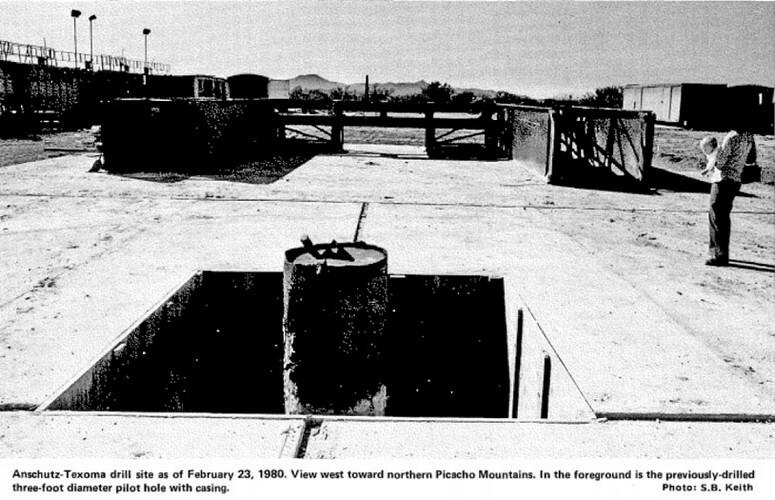 The image shows the well site as it was being prepared. A three-foot diameter pilot hole had been drilled. 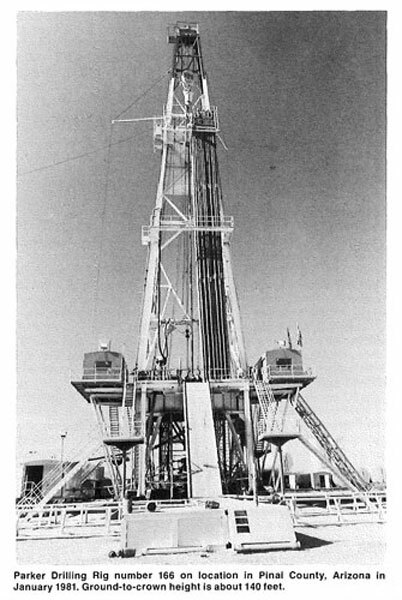 This 140' tall drill rig, that had been moved down from Wyoming, was set-up over the pilot hole. In 1981, after nearly a year of drilling no oil had been found. The well was at a depth of 18,013'. The decision was made to pull the plug on the project, cap the well, and move on. At that point, nine million dollars had been spent on the project. This depth was a new record for Arizona. 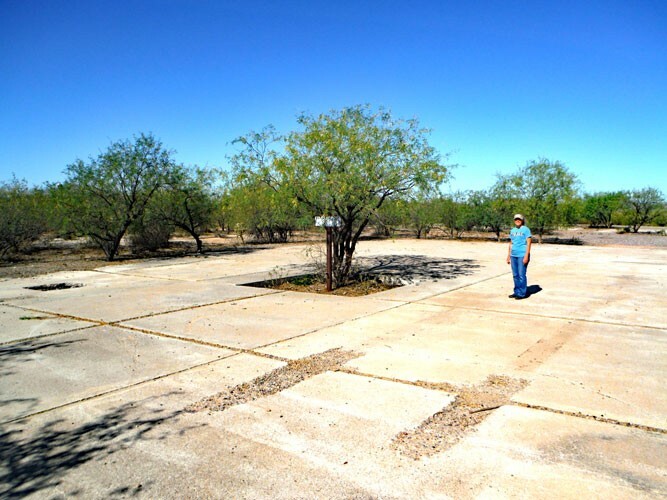 The previous record of 12,500' had been set in 1972 at a test site southeast of Tucson. Today, three concrete slabs at the well site remain. The capped pipe of the deep hole extends upward from an opening in one of the slabs. A primitive road continues west and then south of the well site. In this view, Picacho Peak on Interstate 10 is visible in the far distance. 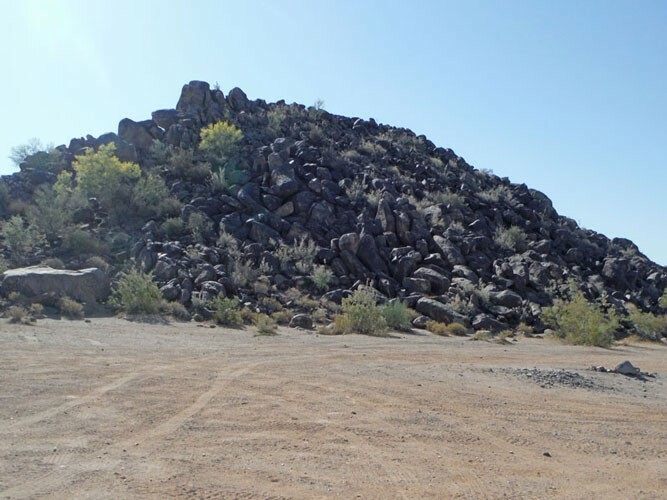 Newman Peak, the high point of the Picacho Mountains, is the nearer peak. North Star Road approximately 2 miles to the south is the connection to make to continue west through the Picacho Mountains. A gravel pit north of the North Star Road is the site of the old North Star Mine. In its early days, the mine was a copper producer. In more modern times, a crusher that was set up here produced decorative yard rock. A few foundations remain from the earlier mne days. 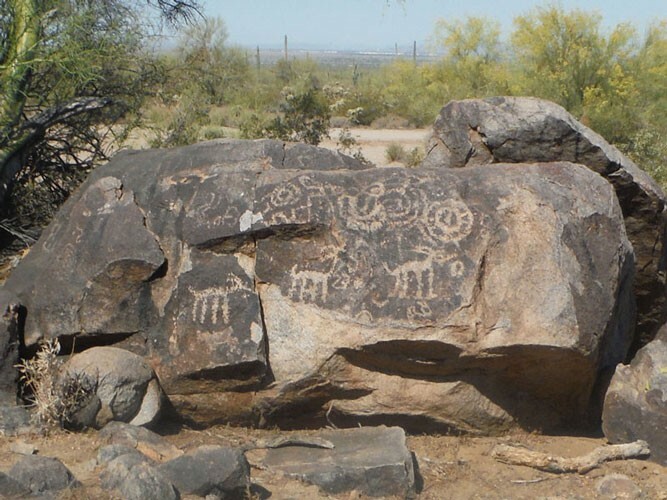 Further west on North Star Road is a pretty well-known petroglyph site. 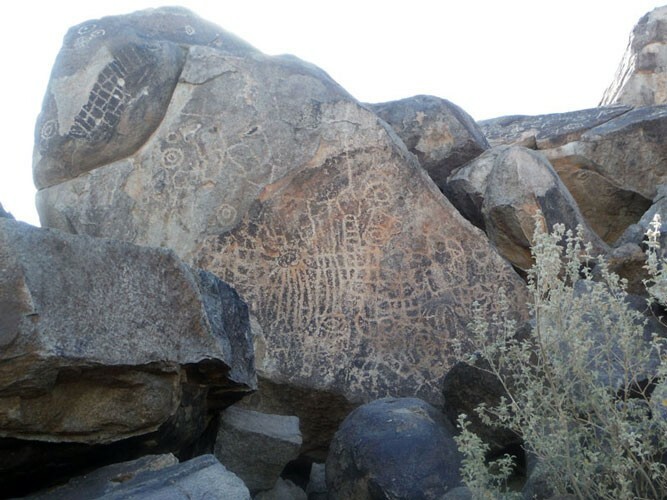 Hundreds, if not thousands, of Hohokam symbols were pecked into the dark-skinned volcanic boulders that make up the small hill. 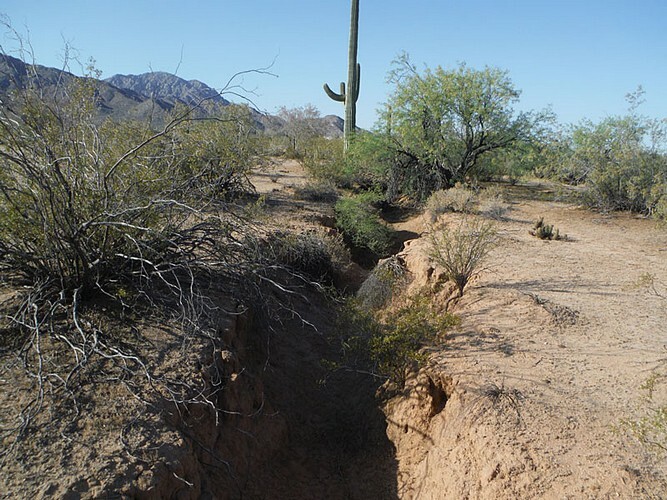 The CAP Canal can be crossed over by continuing west of the petroglyph site. The canal, constructed in the 1980s, carries Colorado River water from the northwestern part of the state to southern Arizona. This canal is one of the limiting factors to east-west travel across the Picacho backcountry. There are few bridges. Not far, on to the west of the CAP Canal, is the Florence Casa Grande Canal that was constructed in the 1920s, to carry water from the Gila River north of Florence down to farms near Casa Grande. The river no longer flows west of Florence because of the dirversion of its water into this canal. A ride south on the canal levee leads to the Picacho Reservoir, which may or may not have water. 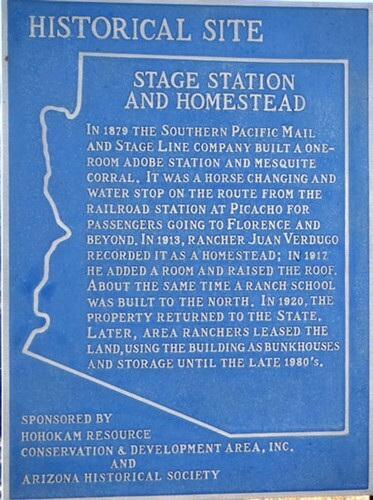 The stage station on the GE image is an officially recognized historical place. A plaque at the site summarizes its history. 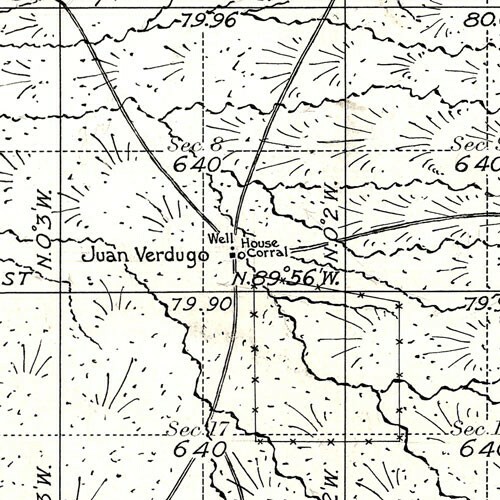 A section of the 1914 GLO survey map shows Juan Verdugo's "homestead". There are no records that accompany this map that show that Mr. Verdugo ever actually received a patent for meeting the homestead requirements. The more northward trending road may have been the route to Florence. The old road to Picacho has been obliterated by modern farming activity. 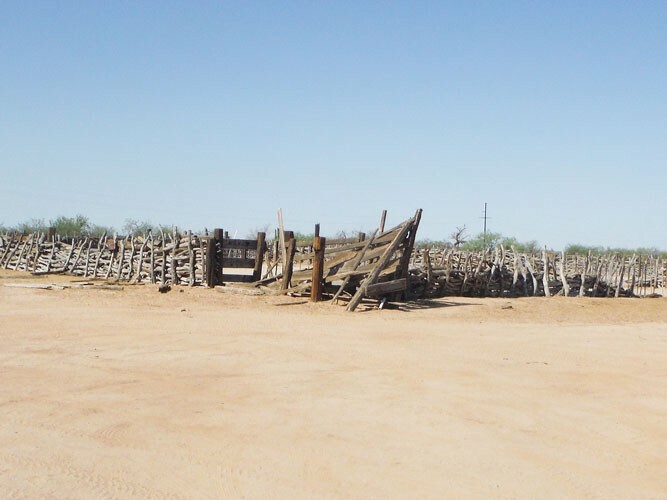 The corrals at the stage station were constructed using a technique called "retaque fencing". 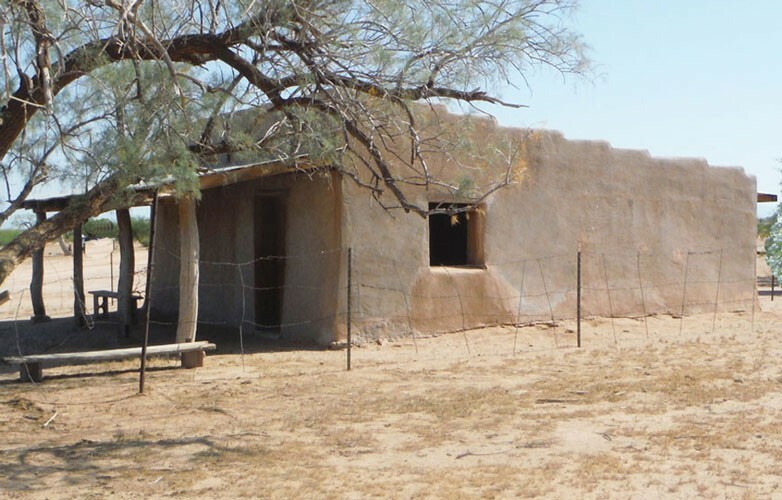 Parallel pairs of posts were put into the ground and then the spaces in between were filled with horizontally placed tree limbs-most often mesquite. 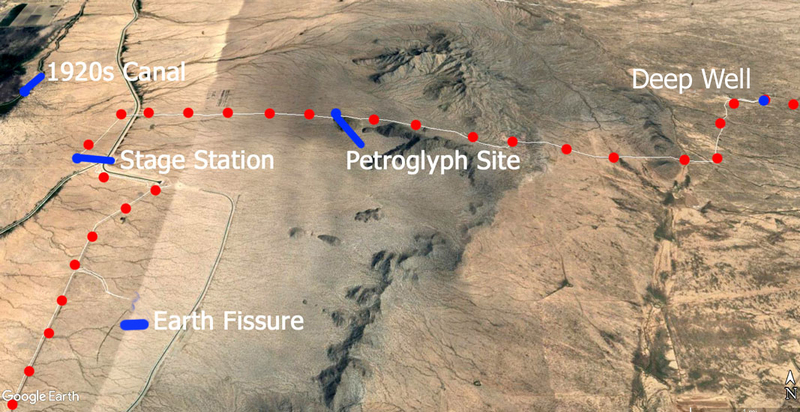 At N32° 47' 30.34" and W111° 24' 48.76", southeast of the stage station, an earth crack or fissure can be found. These features, are thought to occur because of land subsidence. The removal of groundwater may explain the subsidence. In this GE Image, the crack can be seen crossing a road and several drainages. The feature is nearly a mile in length. It has diverted some of the flow from the washes and now supports its own line of vegetation. 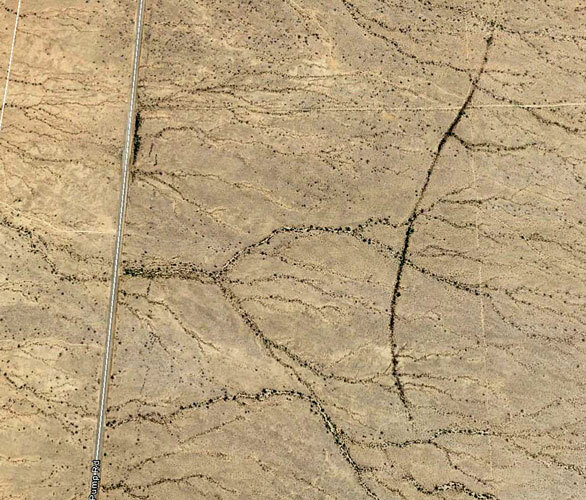 A GE "flyover" of the area reveals other similar cracks. There are several faint sets of tracks that lead out to the land fissure. In the early morning time that I was here, this inhabitant was still fast asleep. I did not go down into the crack for a closer look. This section was several feet deep. Someone was concerned enough to put up a fence and isolate the earth crack. 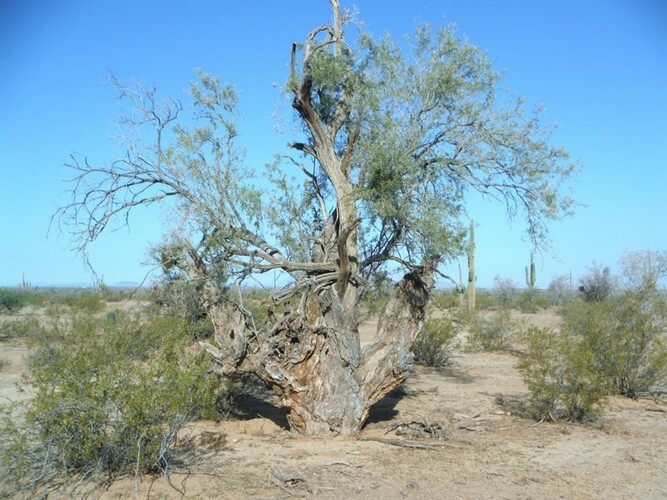 Ironwood trees are very common in the valleys to the sides of the Picacho Range. Many of the specimens are quite gnarly. The southwest exit from the Picacho Mountains is the paved Houser Road out to Highway 87.